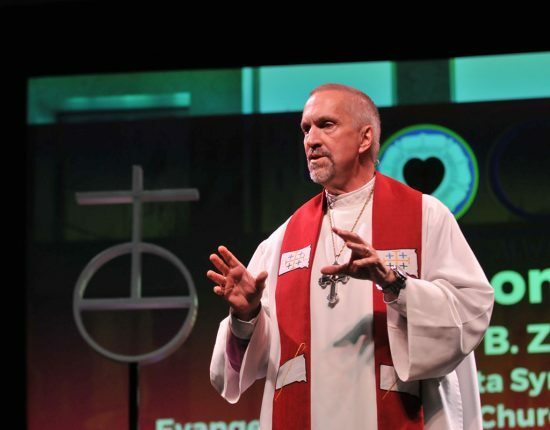 The Reverend David B. Zellmer was elected bishop of the South Dakota Synod of the Evangelical Lutheran Church in America (ELCA) in 2007, after more than a quarter of a century of parish ministry across South Dakota, serving congregations and communities of all sizes. A graduate of Luther Seminary, St. Paul, Minnesota, Zellmer was ordained in the American Lutheran Church (ALC), a predecessor of the ELCA, in 1981 and began his ministry in Aberdeen, South Dakota. Wherever he has served, he has earned a reputation for reaching out to the community as a whole, not just to Lutheran congregations, and for his presence in both civic and religious arenas. In 2000, Zellmer was invited by the U.S. Surgeon General’s Task Force, “Call to Action to Prevent Suicide”, to be a keynote speaker in Portland, Oregon, addressing “Raising Public Awareness for Suicide Prevention.” In 2002, he traveled to Cameroon, Africa, with a team from the South Dakota Synod to support the ordination of women in the Lutheran church there. Open to new ideas and always seeking multiple avenues for the Gospel to reach people near and far, Zellmer has stepped outside the box in his ministry. Zellmer has been a licensed pilot since 1999 and has used airplanes extensively in congregational ministry and in moving himself and others throughout the South Dakota territory. Zellmer and his wife of 43 years, LaDonna Graves Zellmer, a college advisor, are the parents of four children—Christina (Jon) Nath; Joshua (Emily); Sarah; and Michael (Jenna)—and are the grandparents of eleven—Daman, Cooper, Isabel, Cella, Parker, Christopher, Brigston, Leone, Elin, Aidy, and Carter. The Zellmers make their home in Sioux Falls, South Dakota, where the main office of the South Dakota Synod, ELCA is located.